Even the idea of a treasure hidden deep below the briny depths would get anyone excited. With the amount of movies made and books written about hidden treasures under the sea, it is no wonder that this theme has been carried through to video slot games, especially this one by Real Time Gaming. 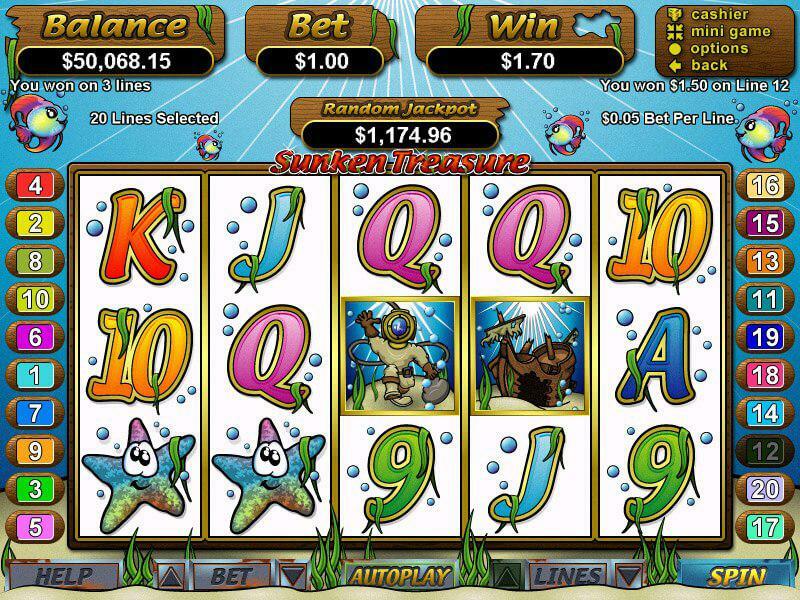 Brought to you by Yebo Casino, Sunken Treasure is a 20-payline slot with five reels that makes hunting for gold coins below the blue waters much more exciting, especially since you won't have to get wet while searching for the treasure. As you may have expected, the symbols only add to the theme and if you're expecting to find a chest filled with gold coins, a sunken ship and a few sea creatures, you won't be disappointed. A penny slot that offers everyone the opportunity to play, Sunken Treasure features a number of symbols that could yield big payouts for you. The first is the treasure chest, which will spill out 2 500 if you find it five times. This is the fixed jackpot, but there is more to be won with the angel fish that pays up to 1 250 coins, and this amount could be double when you use the wild (the diver) to complete the combination. The diver will only show up on the second, third or fourth reels and though he is quite useful to complete winning combinations, you need to know that he will not substitute for the scatter symbol. If you find the scatter, you'll unlock the slot's bonus feature, which allows you to pick one of many treasure chests to open and claim a reward. The bonus game, which is titled Treasure Dive, could see you walking away with all kinds of amazing prizes including payouts, free spins and multipliers that go as high as ten times your bet. Free spins can also be re-triggered, so you could end the bonus game with loads more money than you even imagined. Additionally, when you play the bonus game, you'll notice that some chests may contain either a red jewel or a blue jewel. Finding either of these will take you to the jewel pick mini feature, an extra little bonus in which you can pick treasure chests again for a chance to win up to 500 times what you originally wagered. We know that while slots games are loads of fun, most people are focused on the progressives, and you'll be glad to know that in this game, the progressive is well worth your time. It is currently up to over R150 000, a very impressive sum, and can be won at random by anyone. The game also features the standard autoplay mode which allows you to set your limits and let the reels roll on even if you're not there to push the spin button. This is a fantastic feature for those players who want to play but don't have the time or the inclination to watch the reels constantly spin. This is a fantastic game overall with pleasant illustrations and more than enough opportunities to win. It is well worth playing.